New York City is an extremely foreign-feeling place, especially to a Texas kid like me. Its size is massively beyond comprehension, its people are vastly diverse, and its need for Jesus runs far deeper than the Bible-belt culture of central Texas could understand. Because of this, one of the quickest, most striking observations I made upon arriving was just how little in common New York life has with the life I have become accustomed to. Jesus, in His Great Commission, called us to, “make disciples of all the nations, baptizing them in the name of the Father, the Son, and the Holy Spirit”. This text is not exclusive to foreign mission work; Jesus simply tells us to love on people that don’t look like us–people that don’t believe the same things we believe, people that live vastly different lives than us, people just like the ones we’d meet in New York. These people oftentimes aren’t easy to love, but Jesus never promised us that Christian life would be easy, He always promised that it would fulfill. The first part of this was quite evident as we worked alongside Journey Church Queens throughout the week. Journey Church is in a section of Queens called Forest Hills, a predominantly Jewish neighborhood. I (along with others in the group) went into the week thinking, “How are we supposed to spread Jesus to people that openly deny him?” It’s a tough obstacle to face, because there’s a very fine, oftentimes difficult-to-determine line between lovingly and forcefully sharing your faith, and it completely alters how it’s received. One of my greatest fears going into trips like this is that my inability to appropriately share Jesus with people will make the difference in their faith. However, I’ve found that as soon as I put aside my inhibitions, Jesus moves in miraculous ways. In my life, I’ve exclusively seen Jesus move through love, and that stayed true on this trip. When I stopped focusing on all the differences between myself and the people I encountered, and, instead, simply loved them, I felt a massive shift in dynamic. In a city where seemingly everyone has some sort of angle, this pure, ridiculous, simple love was evidently refreshing. When we played with kids at the park, our willingness to love them with all the unscheduled, water-balloon-filled whimsy in the world produced pure joy. When we passed out granola bars to people coming off the subway, the ridiculous question of, “Hey, would you like a free snack?” baffled people, especially when they realized that we truly had no angle and just wanted to brighten their day. When we picked up trash in parks and on the streets, when we put up flyers for Journey’s block party, and even when we would just smile at strangers we passed, asking them how their day was going, it was clear on the faces of those around us that this absurd, unjustified love was something the people of Forest Hills were not accustomed to. This trip gave me immense hope for the kingdom of God. Throughout the week and at the block party, I saw God move through Forest Hills. People encountered shocking love, saw beautiful community, and found a church that is truly the hands and feet of Jesus. 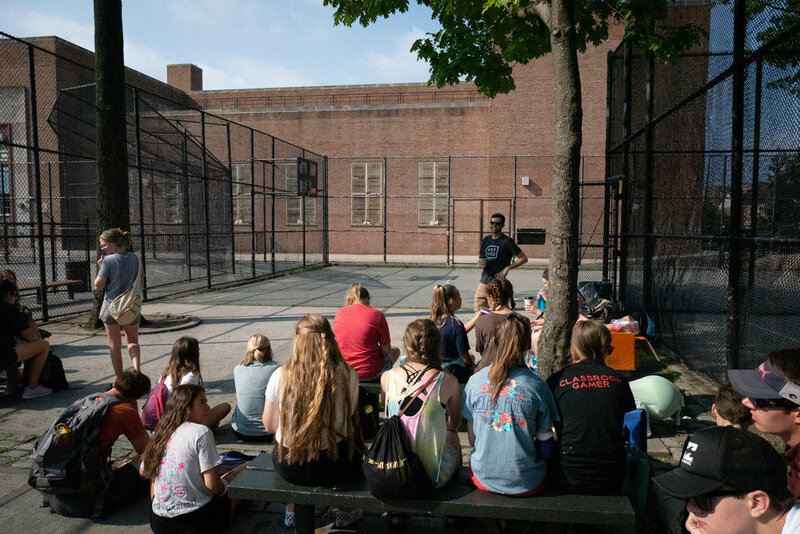 Though our stay in Queens was fairly short, our work planted seeds for people to encounter Jesus. I have great joy in knowing that the love that we spread could lead the people of Forest Hills to a love so much greater, a love that baffles, a love that is never fully expected, a love that fulfills. Want to serve on a mission trip with Vista? Check out our Missions Page! Want to get plugged into Vista Students? Email Chris at chris@thevista.tv!